Phytoceramides are ceramides that are derived from plants. It a part of your skin that your body produces naturally and that keeps your skin looking hydrated, rejuvenated and younger-looking. Although your body naturally produces them, as you age, your body slows down its production which causes your skin to develop the appearance of lines, wrinkles and age spots. The problem with many anti-aging skin creams that contain Phytoceramides is that they are unable to penetrate the innermost layer of the skin which causes it to remain ineffective. This review is going to take a closer look at Miracle Phytoceramides. This supplement is a Phytoceramide supplement that is designed to be taken orally, allowing for the Phytoceramides to penetrate every layer of the skin. 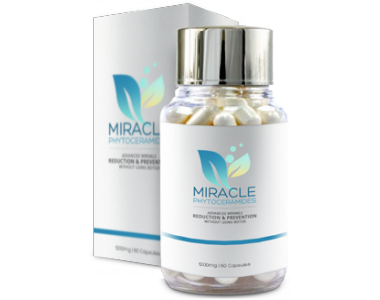 The manufacturer claims that taking this supplement will hydrate your skin from the inside out, reduce the appearance of fine lines and wrinkles will help you maintain a youthful appearance. Other Ingredients: Vegetable Cellulose, Magnesium Stearate, Silicon Dioxide and Microcrystalline Cellulose. Vitamin A can influence the physiology of your skin by promoting epidermal differentiation, modulating dermal growth factors, inhibiting sebaceous gland activity and suppressing androgen formation. It is commonly taken to treat acne and psoriasis. Vitamin C regulates the structural protein collagen. A deficiency in Vitamin C can cause your skin to become rough. Vitamin D destroys free radicals that can cause premature aging. Vitamin E blocks free radicals that cause aging. It is worth noting that the Phytoceramide dosage is significantly less than most other Phytoceramide supplements we have seen. How Do You Use Miracle Phytoceramides? The manufacturer recommends that you take one veggie capsule daily. You should not exceed the daily dosage. If you are pregnant, nursing, under the age of eighteen or under medical supervision, you should talk to your doctor before taking this supplement. You can purchase this supplement exclusively through third-party retailers. We found that it has been discontinued from most third-party retailer websites and were unable to find a price. We were unable to find a manufacturer’s guarantee or a manufacturer’s official website. This is risky because it means that if you purchase this product and it doesn’t work for you or you experience adverse side effects, you might not be able to get your money back. This product appears to be a promising tool that may help you achieve rejuvenated, younger-looking skin. 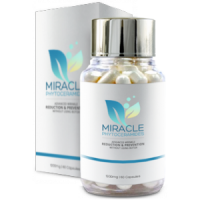 It comes in easy to take vegetarian capsules and is formulated with several ingredients that have been shown to contain properties that can improve the condition of your skin. However, this supplement contains a significantly lower amount of Phytoceramides per serving, relative to most other Phytoceramide supplements we have seen. It has been discontinued from all of the third-party websites that used to have this supplement in stock which suggests that this is not a popular or worthwhile supplement. Furthermore, we were unable to find an official manufacturer’s website or guarantee. Taking these factors into consideration, this product is too risky. 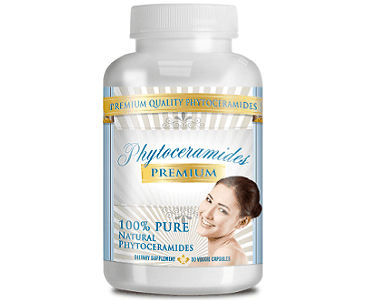 You are better off purchasing a Phytoceramide supplement that is backed by a strong manufacturer’s guarantee, contains the recommended dosage of key ingredients and is current on retailer’s websites.